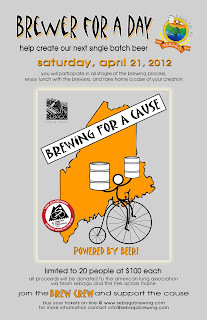 Each year since 2010 Sebago Brewing Company has opened its doors on a Saturday for a limited number of people to participate in their Brewing for a Cause benefit. Sebago has a team of riders in the Trek Across Maine (click the link to donate) and for a $100 donation you are given the opportunity to “work” in the brewery with the brew staff making their delicious Trekker Pale Ale. I convinced my wife this would be the perfect early Father’s Day present for me and signed up just in time as the event sold out (actually slightly over sold). Yesterday morning I woke at 5:30 and prepared to head to Sebago’s brew facility located on Sanford Drive in Gorham, Maine. I arrived shortly after 7:30 and the parking lot quickly filled up with other eager participants. For most it was their first time but there were at least a couple that were returning from prior years. We were all encouraged to bring home brew for others to sample however I have not yet tried brewing my own beer so I arrived empty handed. Shortly before 8:00 we all ventured into the brew facility and found Barnabas and Kevin already hard at work getting the first batch of Trekker in the mash tun. 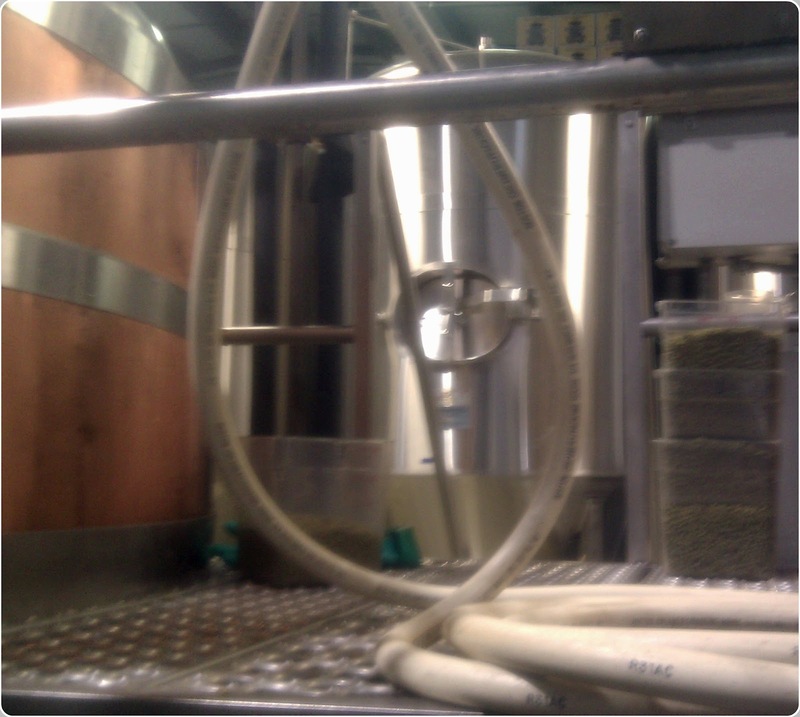 The Trekker Pale Ale sold out very quickly in 2011 so this year they brewed a double batch. The 50 pound bags of malt are poured into Sebago’s high tech system of adding them to the hopper. 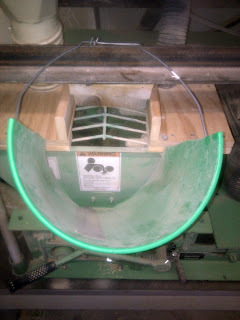 It is a bucket that has been cut down to work as a funnel and it worked very well. We also had the opportunity to taste the 2-row malt to see how the raw product tasted. Once the malt has been added it is milled, a process that cracks open the husks exposing the inside and it waits to be mixed with the hot water in the mash tun. After we were finished in the grain room Jon, Barnabas and Kevin had to take some time to fix the first problem of the day. The grain mill was not accurately measuring the weight of the malt being added to the mash tun which could cause all kinds of problems with the final product. After some time Jon determined there was a setting that was off and he was able to fix the problem to avoid any issues with the next batch. 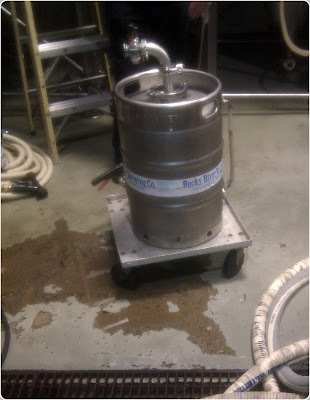 Brewers often battle with these things during the brew process and this was not the last issue of the day. After the problem was resolved it was time to transfer the wert, the hot water that has been steeping in the malt for about an hour, from the mash tun to the brew kettle. 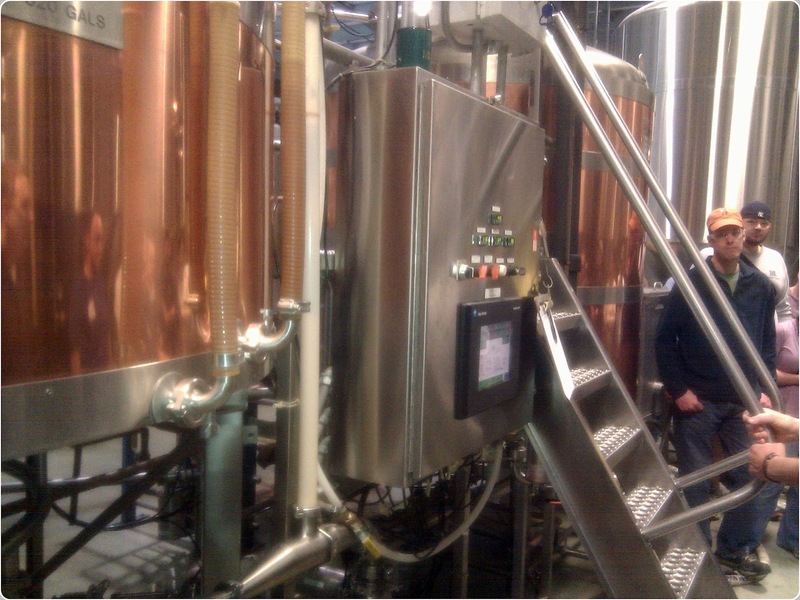 Sebago Brewing uses a gravity system from Diversified Metal Engineering (DME) in Canada. Many of the brewers in Maine use a similar system and although the picture does not show this well the mash tun is installed slightly higher than the boil kettle so most of the wert can be transferred by gravity. 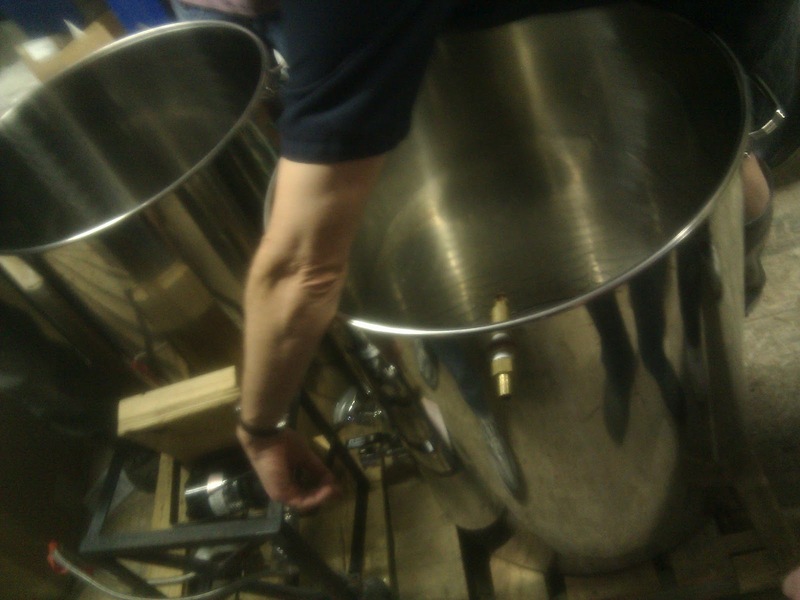 They do use a pump to get the final bit from the mash tun to the brew kettle. Once the 650+ gallons of wert has been transferred the spent grain is removed from the mash tun and is eventually hauled off by local farmers as feed for their herd. The spent grain looks and smells a lot like oatmeal. I have photos and video of this and have posted them on my Facebook page if you are interested. Once all the liquid is in the boil kettle it is time to add the hops. For the Trekker Pale Ale hops are added at 3 different times during the boil process. First at the beginning of the boil for bitterness, second about 30 minutes in for flavor and finally with about 5 minutes remaining for aroma. All of this may seem like a quick process but by the time the boil has finished the process has taken about 5 hours. For us that means we were quickly approaching lunch time and Jon stepped out briefly to pick up a very nice spread from the Gorham brew pub. About this time Kai Adams – founder of Sebago stopped by and took the time to speak to each of us. He was also there to help out with the second problem of the day. Seems the boiler was not turning off at the appropriate pressure and after a few phone calls a tech appeared on site to help fix the problem. Like the first problem this one was resolved fairly quickly however we got to experience a true brew day with the minor issues that brewery staff are constantly dealing with. While Jon was gone (or maybe before) several of us found the tasting room which had 7 different Sebago brews including some that were only available during the pilot brew night at the Portland brew pub. The Milk Stout was finished fairly quickly however they had a couple of my favorites; Full Throttle Double IPA and Elegans Saison and another from the pilot beer night The Catch III. Jon made it back with pulled pork, fresh fruit, coleslaw, corn bread and a platter of desserts. The food was excellent and if anyone left hungry it was not because of a lack of food. Also during lunch many of the participants took out their home brews for everyone to sample. There was a wide range of options including a barley wine that did not start out as a barley wine and an IPA from a husband and wife team that was excellent. 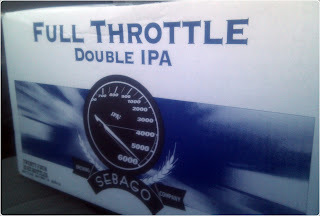 During the transfer and boil we also had the opportunity to check out Sebago’s pilot system. 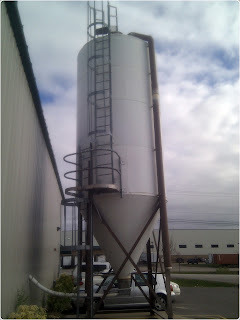 This is the brew system they use to test new recipes and give the brewers the opportunity to experiment. 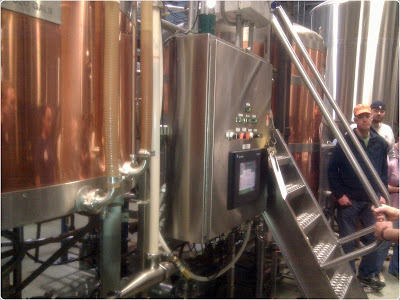 Many of the Single Batch Series and the beers available at the Pilot nights were brewed on this system. The homebrewers that were in attendance had a lot of questions about the setup and many of them wanted to take it home with them. We also had the chance to taste the Porter, Hefeweizen and their first attempt at an Oktoberfest directly from the bright tanks. This is where the beer is held after fermentation until it is bottled and each of these beers tasted wonderful with the Hef having huge amounts of aroma and big banana taste. Even though the beer had not been carbonated at this point in the process it was still excellent. After lunch was finished it was time to transfer from the boil kettle to the fermentation tank and to add the yeast. The yeast is stored in old kegs and used approximately 12 times before it is retired. This process was fairly straight forward and the primary concern was sanitation. Lots of scrubbing on the nozzles and attention is given to hoses to ensure there is no contamination. The transfer between tanks went fairly quickly and at that point we were ready to start the second batch of Trekker Pale Ale. It may seem like there is a lot of down time while the beer is in the mash tun, boiling or being transferred between tanks but during this time Jon, Barnabas and Kevin were all very busy preparing for the next step, cleaning up from the prior step and at least on this day entertaining 20+ beer enthusiasts. Each of them spent a lot of time answering questions, explaining the process multiple times, giving tips to the home brewers on how to improve their brews and generally entertaining us. The three of them did an excellent job as 8 hours is a long time but the day went by very quickly. They were not prepared to bottle anything but Jon was kind enough to give us a demonstration of the bottling line including the labeling, rinsing of the bottles and capping. This seems like the a very tedious part of the process and I am sure it gives Jon lots of headaches as the packaging manager. They have a single bottling line which can accommodate both 12 and 22 ounce bottles. Again I have videos and pictures of the bottling line in action on my Facebook page. If you check them out please take the time to like my page to keep up with beer reviews, news and articles. After the transfer to the fermentation tank was complete and the second batch of Trekker Pale Ale was in the mash tun we had about an hour left in the day. During this time Barnabas, Kevin and Jon answered tons of questions and everyone spent lots of time talking beer. 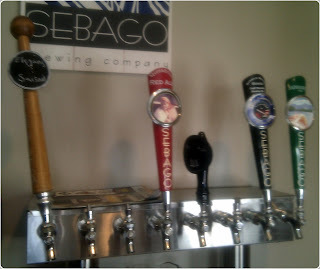 I really enjoyed my time at Sebago Brewing and will certainly plan to attend again next year. Also towards the end of the day I got another nice surprise. 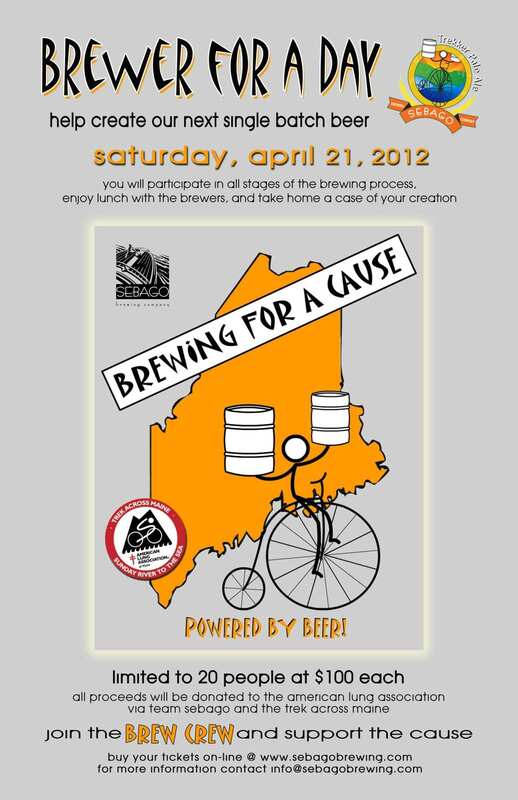 When I registered for the event it mentioned all participants would have the opportunity to bring home some of the beer we brewed. Due to the time it takes to ferment, bottle, etc the beer would not be available on the actual brew day so Jon prepared a list of names, phone numbers and e-mail addresses so he could contact us when the beer was ready to be picked up. 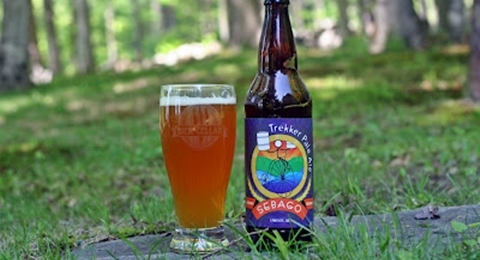 I assumed we would each receive a bottle of the Trekker Pale Ale however Jon let us know we could trade our case (12 – 22 ounce bottles) of Trekker for any other Sebago beer so we would not have to make the trip back to the brewery. Fortunately this included their Full Throttle Double IPA. I do enjoy the Trekker Pale Ale but I love the Full Throttle so I took home a case of this as did many others. I had no idea what to expect when I signed up for this event but for someone that loves Maine Beer and was very interested in learning more about the process $100 was a small price to pay. Also the money was going to a great cause and one that means a lot to me as my grandfather died of lung cancer. At the end of the day the $100 seemed like a bargain for a day spent with great people, tasting great beer and enjoying some great food from Sebago Brewing. If you have not been to this event in the past I encourage you to sign up next year as I am certain you will enjoy it. Also please take the time to sponsor the Sebago team in the Trek Across Maine here as each rider needs to raise $500 and the money goes to a great cause. Thank you Jon, Barnabas, Kevin and Kai for a great day at the brewery and I will see you all again next year if not before then.